The vibrant green of the high plateau in Borneo is almost surreal. MALAYSIAN BORNEO IS STRAIGHT out of an explorer’s dream. It’s home to the tallest mountain in South East Asia, the largest underground cavern in the world, and mile after mile of wild rain forest. If it’s adventure you’re after, bypass the glitzy dive resorts and golf courses in the northern province of Sabah and head south to the jungles of Sarawak for some trekking. Sarawak trekking takes more than a little slogging through muddy, leech infested territory. As you remove your sock to flick off what seems like the thousandth bloodsucker to wriggle its way through the mesh of your boot, you may find yourself questioning your choice of destination. Surrounding you, though, will be some of the most bio-diverse forest in the world: home to 15,000 species of flowering plants, 3,000 species of trees, and 221 species of terrestrial mammals. At the end of the day, safe and dry in a jungle hut with a stomach full of rice and tasty jungle vegetables, you won’t find yourself regretting a trip to Sarawak. Sarawak offers a lot of options for jungle trekking. From large cities on the coast, you can catch a ride in a longboat or 4×4 to a tribal longhouse in the interior. There, you’ll sample the local cuisine and have the opportunity to discuss trekking options with local guides. Many of these easily accessible longhouses have started to see a lot of traffic. You may find that they cater well to tourists, but provide a less authentic experience. 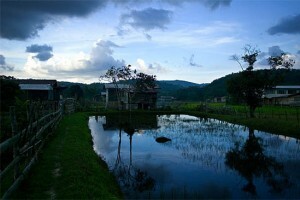 The village of Bario, high in the Kelabit Highlands, offers a more remote option. The village is accessible only accessible by six seater Twin Otter, and flights operate early in the morning to beat the afternoon fog. Watching the twin peaks of Bukit Batu Lawi pass even with your wingtips as you descend to Bario’s tiny grass airstrip isn’t something you’ll soon forget. 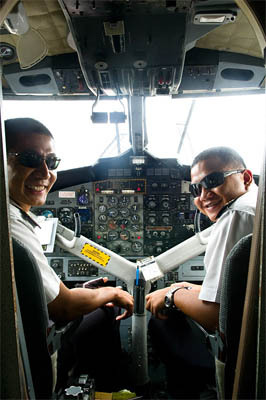 The friendly MASWings pilots keep the cockpit door open during the short flight from Miri. If you ask nicely they may make a detour to give you better views of the local mountains. Flights to Bario from Miri are a reasonable 70 Ringgit (USD 22) or an even more reasonable RM 55 (USD 18) from Marudi. It’s actually possible to trek to Bario all the way from Miri, but it’s an extremely strenuous three week trip through some very rugged jungle terrain. Check out this guy Jeff’s blog for some pointers if you think you’re up to the challenge. Once in Bario, you may find the hardest thing to do is make yourself leave. Once in Bario, you may find the hardest thing to do is make yourself leave. The high plateau air is invigoratingly chilly, and the vibrant green of the surrounding agricultural land is almost surreal. It would be easy to pass a few lazy mornings sipping steaming tea and reading a book on the porch of one of the basic guesthouses scattered through town. Expect to pay about RM 50 (USD 15) per person per night for accomodation and food. Don’t be surprised if you find yourself answering the same questions several times an hour. Kelabit hospitality is legendary, in no small part thanks to the tasty food they prepare. Meals consist of a mix of cultivated rice, wild game, and jungle vegetables. Cultures across Asia claim to produce the best rice in the world, but in the Kelabit Highlands those claims aren’t far off the mark. The tender, long grain Bario rice will give you a new appreciation for rice as a meal rather than a staple. Kelabits eat rice three meals a day, but with the endless methods of preparation you won’t find yourself bored anytime soon. Be sure to try the Kelabit equivalent of an energy bar: sweet, cooked rice molded to the shape of a bar and tightly wrapped in a banana leaf. When you’re ready to hit the trails and start exploring, Bario offers plenty of options and makes an excellent base for exploring the area. Consider making the three day trek from Bario to Ba’kelalan via the tiny, peaceful village of Pa’Lungan. Those looking for a more strenuous option can tack on a side trip up Mt. Murud along the way. Other options include a three day trek to dramatic Bukit Batu Lawi, whose rocky twin peaks were photogenic enough to attract a North Face advertising film crew a few years ago. Ba’kelalan has the same highland agricultural atmosphere of Bario, but is slightly more connected to civilization. It sports both an airstrip and a rough logging road running all the way to the coast. A seat in a souped up 4×4 headed to Lawas will cost you slightly more than a flight, but the five hour roller coaster ride on sketchy dirt roads is an adventure in itself. Ba’kelalan is famous for having convinced apple trees to grow in the cool climate. If you visit in late March, you may be lucky enough to catch the annual apple festival. Locally produced salt is a source of Ba’kelalan pride. At one of the village’s salt springs, you can watch the production process from start to finish. Rain and mud make jungle trails hard to follow, and the difference between a game trail and a walking trail is often a matter of opinion. Getting lost could be life-threatening. Unless you’ve spent a lot of time navigating similar terrain, don’t venture into the jungle without an experienced guide. The going rate for guiding is somewhere around RM 60 (USD 20) per day plus tip. You won’t have any trouble finding a guide in Bario if you ask around, but consider getting in touch with Walter Paran or his brother Mado. Both live in Pa’Lungan and will take great care of you on the trail. Kelabit woodsmen are true masters of their environment, and watching one in action is a fantastic learning experience. Kelabit woodsmen are true masters of their environment, and watching one in action is a fantastic learning experience. When not guiding tourists, many woodsmen prefer to travel through the jungle off-trail because they say they can move faster that way. The parang or machete is the woodsman’s Swiss Army Knife. Throughout your hike, you’ll probably see your guide put it to more uses you can count; hacking clear overgrown trail one minute, and delicately peeling jungle tubers for you to taste the next. You’ll want to pack light for a jungle trek. You’ll gain significant elevation no matter which way you head from Bario, and at least half of the hike to Ba’kelalan is uphill. Bring iodine to purify water, water bottles, a first aid kit, rain gear, and a fleece. 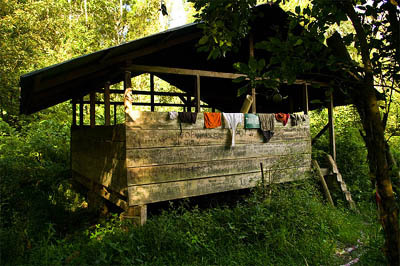 You’ll either stay with Kelabit families or in simple, open, jungle shelters along the way so you won’t need a tent. A hammock or sleeping pad and light sleeping bag can make for much more comfortable nights. If possible, leave the bulk of your gear in a Miri airport locker or in Bario if trekking a loop route. Leeches are disgusting, but harmless. (Just keep reminding yourself that unlike mosquitoes, leeches don’t carry disease). A bit of deet sprayed on your boots will help, but if you think you’ll avoid them completely you’re sorely mistaken. Flick leeches off sideways, as grabbing and pulling only makes them hold on tighter. Note that the ancient footpath route to Ba’kelalan zig-zags briefly into Kalimantan Indonesia. You won’t need a visa if you’re just passing through on your trek, but you must carry your passport. The tiny jungle border crossing isn’t a visa on arrival location. Don’t expect to cross into Indonesia and stay unless you planned ahead and already have a visa. Gunung Mulu National Park is home to Sarawak Chamber, the largest cave chamber in the world. The park is accessible by air from Miri, and has a modern tourist infrastructure of maps, lodging, and wooden walkways. Experienced guides lead adventure caving trips into the park’s wild caves, including Sarawak Chamber itself. For the most technical spelunking, try the Clearwater Connection route. You’ll spend 5-7 hours crawling through tight passages, descending fixed ropes, and wading waist deep through underground rivers to link two of the parks most impressive show caves. In Sabah, you can hike up the highest mountain in South East Asia: Mt. Kinabalu. The traditional two day hike ends with a 4am alpine start to catch sunrise on the summit. Those wanting more adrenaline should check out the newly completed highest via ferrata in the world. Bolts and iron cables keep you safe as you explore Kinabalu’s more exposed flanks. Matador travelers who can share stories of their time in Malaysia include islandhapa, who attended a tattoo convention in Borneo, and NomadicMatt, who included Sarawak on his list of 8 Ways To Get Off The SE Asian Tourist Trail. We are passionate travelers. Join the Matador community today.